We invite you to visit our Amazon Wishlist, a registry of items used by our patients and their loved ones; from books and games for our Children’s Drop In to textbooks for our library. Can you help the Hospice by gifting any of these items? Planning on buying something from Amazon? 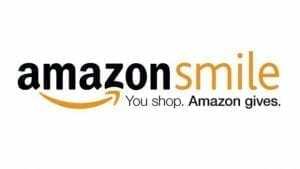 AmazonSmile donates 0.5% of the net purchase price (excluding VAT, returns and shipping fees) of eligible purchases to the charitable organisation of your choice. AmazonSmile is the same as Amazon: Same products, same prices, same service. Did you know that whenever you buy anything online – from your weekly shop to your annual holiday – you could be raising a free donation for St Andrew’s Hospice? There are nearly 3,000 retailers on easyfundraising.org.uk ready to make a donation, including Amazon, Tesco, Asda, Next, eBay, Thomas Cook and Argos – it doesn’t cost you a penny extra! Head to www.easyfundraising.org.uk/causes/standrewshospice/ and sign up for free. After you’ve checked out, that retailer will make a donation to St Andrew’s Hospice for no extra cost whatsoever! There are no catches or hidden charges and we are really grateful for your donations.